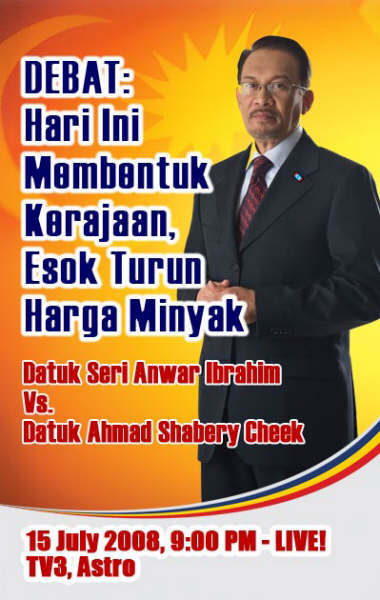 After spending the night on IPK KL’s cold hard cement floor, this morning, Anwar Ibrahim is free. He will hold a press conference at 2 pm at his home. But Raja Petra was due at the IPK, said to be charged for criminal defamation. But he was arrested while on the way there (is this police SOP now?) and whisked to the Duta High Court. What the ************!!!! If the two had the opportunity to meet there and compare notes, they may stumble upon the fact that the architects of their persecution are one and the same. Posted by elizabethwong in Current Affairs, Human Rights, Malaysia, Politics. After the splendid showing where Anwar Ibrahim trounced the Minister of Information (who promised to resign if he did badly, BTW), now the dastardly news. Anwar was arrested when he exited his house enroute to IPK was near his house at Bukit Segambut when returning from his interview with the Anti Corruption Agency before heading to IPK Kuala Lumpur. According to Chegubard who was with him, his car was surrounded by a group of Special Taskforce Police (Unit Tindakan Khas – UTK, the same guys who smashed his house in 1998) wearing masks. They took him into a black-tinted car and drove off. Anwar’s arrest was well ahead of his deadline of 2.00 pm meeting time to give his witness statement. According to his lawyer, he is being taken to the now infamous Brickfields Police Station. the Kuala Lumpur Police HQ (IPK KL). In anticipation of the vote of no-confidence scheduled to be up on Monday morning, the police have set up road blocks all around Kuala Lumpur. There appears to be an order to lock-down the Parliament on Monday morning from 7 am onwards. Question is: Are the police doing this to protect public security or to deter the curious and interested public from turning up in Parliament tomorrow. There is no rally tomorrow at Parliament scheduled. But there is an emergency motion on the state of the country especially since the price hike of fuel and other basic essentials. Lest we forget, Parliament is not a security-zone. This is the second time the police have attempted to stop public access to the very halls which decide on laws which govern our lives, where debates pertaining to our lives and livelihood occur. We have every right to go in, witness the debates just as with public access into any other public buildings. So in an attempt to shield all the Prime Minister’s men/women tomorrow morning, the traffic jam has sprawled as far as Klang where I was this morning. This doesn’t inspire any further confidence in Abdullah Badawi. 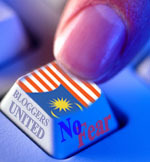 Posted by elizabethwong in Current Affairs, Democracy, Event, Malaysia, Note2Self, Politics. Posted by elizabethwong in Event, Malaysia, Note2Self. It was only much later I found out the godfather of Malaysian underground music, Joe Kidd, Bullet and the rest of Carburetor Dung graced our protest (and this time, not as protestors) and are now subjects of a media witch-hunt in light of having nothing better to report on. Let it rest, guys. It was a misunderstanding. Nope. I am *not* on strike unlike some bloggers; I don’t fancy being an ostrich when the calling is to elucidate, not obfuscate, more so if one claims to be a writer. These are the times that try men’s souls… Tyranny, like hell, is not easily conquered; yet we have this consolation with us, that the harder the conflict, the more glorious the triumph. What we obtain too cheap, we esteem to lightly: it is dearness only that gives every thing its value. So no boycotting but have been busy. In between functions and meetings, I’d been chasing the spectre of ‘army trucks’ since yesterday. Heard from a few people who in turn heard from some other f’lers there were army trucks la at Sentral la, Kelana Jaya stadium la, Padang Timur la, outside their house oso got. So off we went, the non-ostriches. But when we got to those sights, nada, zero, nothing. Meanwhile today, one could be mistaken there’s a Liverpool, Man U match going on. The crowd started moving in at 10 am. Menteri Besar Tan Sri Khalid Ibrahim is scheduled to be at the Kelana Jaya Stadium at 5 pm. I heard MB Kelatan Nik Aziz too will be there. Anwar Ibrahim will set the stage ablaze at 9 pm. So if you’re still at home reading this, it’s not too late to grab your red shirt, red cap, red scarf, red vest, red tudung and mari mari ke stadium! No to price hike, No to economic mismanagement, Yes to people’s power! If Bala had erred in his statutory declaration, Najib Razak should have instructed his lawyers to sue him, instead of getting him to take out all references pertaining to the latter. Or maybe it was just easier, since Bala was summoned to the Brickfields Police Station right after his press conference, that a phone call between friends can kow-tim without parting with hard-earned commissions to lawyers? This is better than kancheong kitchen! * The Protest Against Fuel Price Hike on Sunday has moved to Kelana Jaya Stadium. Specially for those weak-kneed-at-sight-of-boys-in-blue-n-fatigues liberals who can now rally in style and under shade. No A&W snacks though. Posted by elizabethwong in Current Affairs, International, Malaysia, Politics. 1. I have been a police officer with the Royal Malaysian Police Force having jointed as a constable in 1981 attached to the Police Field Force. I was then promoted to the rank of lance Corporal and finally resigned from the Police Force in 1998 when I was with the Special Branch. 2. I have been working as a free lance Private Investigator since I left the Police Force. 3. Sometime in June or July 2006, I was employed by Abdul Razak Baginda for a period of 10 days to look after him at his office at the Bangunan Getah Asli, Jalan Ampang between the hours of 8.00 a.m. to 5.00 p.m each working day as apparently he was experiencing disturbances from a third party. 4. I resigned from this job after 2 ½ days as I was not receiving any proper instructions. 5. I was however re-employed by Abdul Razak Baginda on the 05-10-2006 as he had apparently received a harassing phone call from a Chinese man calling himself ASP Tan who had threatened him to pay his debts. I later found out this gentleman was in fact a private investigator called Ang who was employed by a Mongolian woman called Altantuya Shaaribuu. 6. Abdul Razak Baginda was concerned that a person by the name of Altantuya Shaaribuu, a Mongolian woman, was behind this threat and that she would be arriving in Malaysia very soon to try and contact him. 7. Abdul Razak Baginda informed me that he was concerned by this as he had been advised that Altantuya Shaaribuu had been given some powers by a Mongolian ‘bomoh’ and that he could never look her in the face because of this. 8. When I enquired as to who this Mongolian woman was, Abdul Razak Baginda informed me that she was a friend of his who had been introduced to him by a VIP and who asked him to look after her financially. 9. I advised him to lodge a police report concerning the threatening phone call he had received from the Chinese man known as ASP Tan but he refused to do so as he informed me there were some high profile people involved. 10. Abdul Razak Baginda further told me that Altantuya Shaaribuu was a great liar and good in convincing people. She was supposed to have been very demanding financially and that he had even financed a property for her in Mongolia.